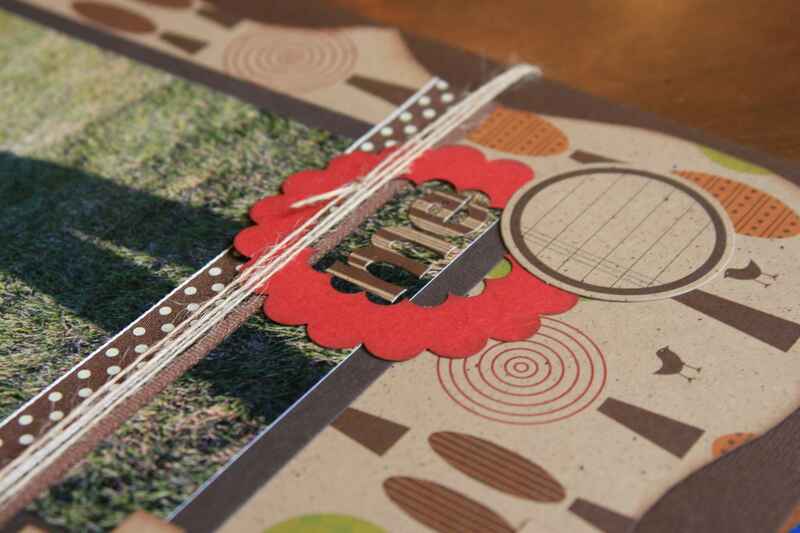 Here’s a layout I worked on during our retreat at Zane Trace Inn. 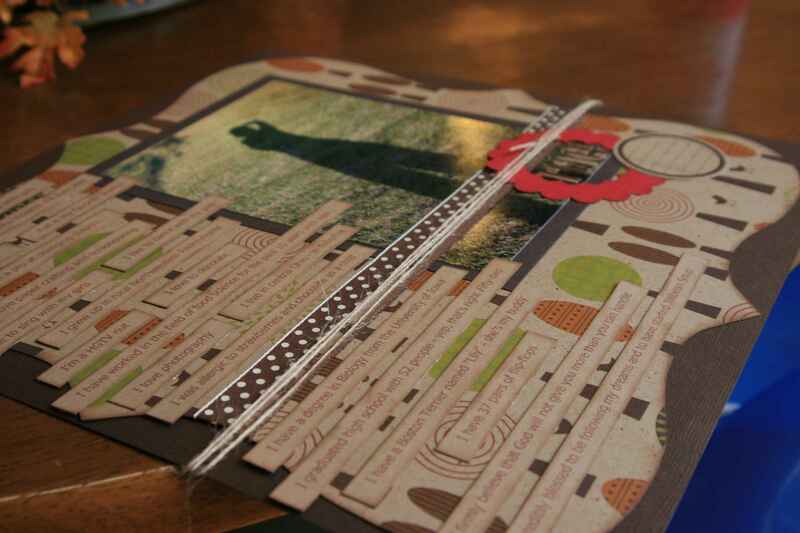 The journaling was created using the “About” page from this blog. So, the layout is all about “me”. I used “Shittake” from the Cream of Mush line and created the die cut from another piece of patterned paper (I think I used one from Making Memories). 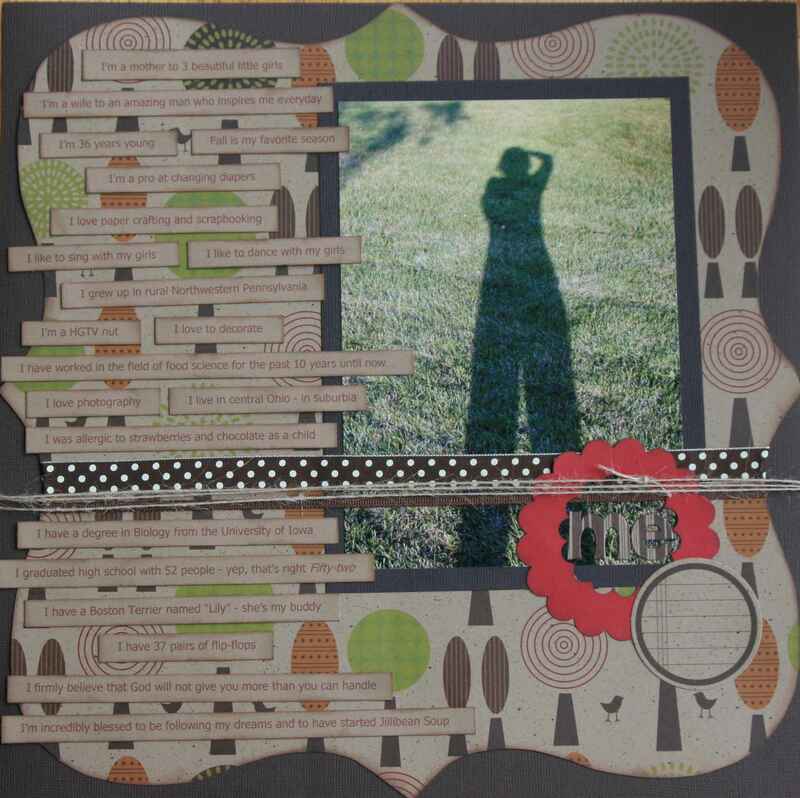 Also, the red frame around “me” was created using 2 punches….one large scallop punch (from EK Success) created the large scallop and then I used a smaller punch (Stampin’ Up) to create the inner hole. The red looks a bit flourescent in the photo – sorry…it doesn’t look that crazy in person. I added a journaling sprout last but have not journaled anything on it yet. Any ideas what I should put on it? I was going to put “36” (for my age) but it didn’t work with the “about” journaling. Any other ideas? Any cute charms or new buttons or fun do-dads I could use? How about “Living the Dream”….because everything seems to be falling into place. Or “Out of the Shadows”…..It talks about the real you and goes along with the picture. Or…put a small picture of your face on the Sprout. I’m just full of ideas, aren’t I? Won’t be offendend if you don’t take any of them. i love flowers on my lo’s—how about a flower that fits right into the middle of the journal circle and then a cool big brad to match your bright scalloped circle. just an idea. i love the lo! i really like the ribbon and string acroos the middle! jen t.